Julienne or finely slice the vegetables and tip into a bowl or onto a serving platter. Mix together the dressing ingredients – thin out, if you prefer, by whisking in a little boiling water. 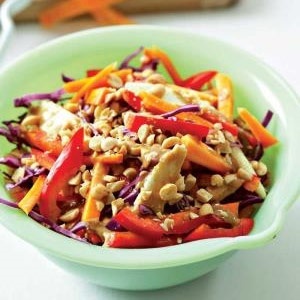 Spoon over the slaw, sprinkle with the peanuts and serve.